Oxygen and humidity are coffee's enemies - they attack the oils and flavors of the bean and cause the taste to deteriorate. 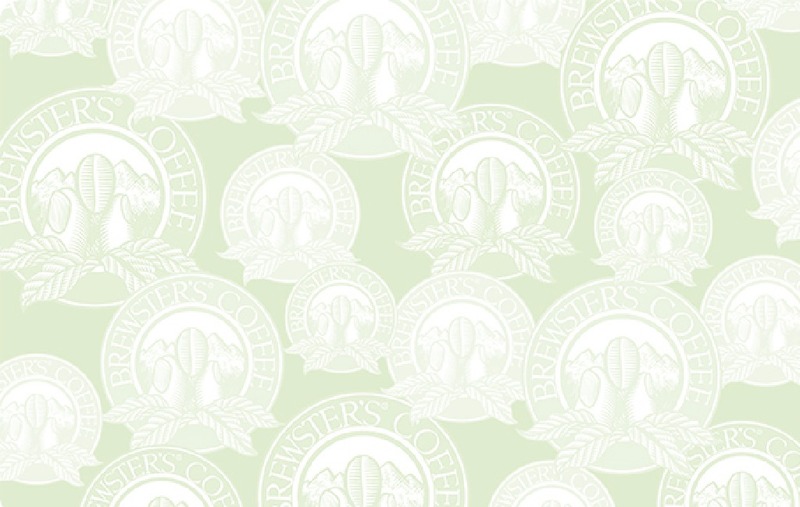 Every Brewster's® Coffee variety arrives at our stores sealed in a special bag that doesn't allow oxygen or humidity to enter. Unlike whole bean coffee displays in supermarkets, we turn our coffees over very fast, and our customers know that they are getting better and fresher coffees than most supermarkets are selling. After opening the Brewster's® Coffee bag, keep your coffee in something airtight (a glass jar with a gasket seal works great), and keep it stored inside a cupboard. It's best to keep your coffee at room temperature, and minimize its exposure to oxygen and sunlight. Avoid storing coffee in your refrigerator or freezer. Water is 97-98% of the cup, so water quality greatly affects the taste of coffee. Use the best quality water possible when brewing. Run the water from your tap for 15 seconds to make sure it's fresh. If your tap water has any off-flavors, aromas, or sediment, consider using filtered or bottled water for your brewing. The resulting improvement in flavor can be remarkable. The correct grind ensures a flavorful, well-balanced extraction. Too coarse a grind results in a weak tasting cup of coffee; too fine a grind results in a bitter tasting cup of coffee. While blade coffee grinders (the type that has the spinning propeller-like blade) are reasonably priced and easy to use, they can over-grind the coffee very easily. A burr-style coffee grinder (built with adjustable steel grinding discs) is an upgrade machine, but most consumers find their ease of use and exactness of grind is well worth the investment. Proportion refers to the amount of ground coffee used in relation to the amount of water when brewing a pot of coffee. While everyone's tastes are different, we recommend starting with two level tablespoons of ground coffee for every six fluid ounces of water. (Don't trust the markings on your coffee maker's carafe, measure the water. Remember that one measuring cup is eight fluid ounces.) Using too little coffee results in a weak and bitter extraction. Use too much, and the coffee will taste overwhelmingly stout. For best results, we recommend that coffee should be brewed with the hottest water possible (ideally between 195°F and 205°F, although many household brewers aren't designed to heat the water enough) to ensure proper extraction. Many consumers prefer to use a traditional manual pour-over brewer because of this, as they are able to better control the time and temperature of the brewing. Holding time refers to the length of time the coffee is allowed to remain in an airpot, or on a burner, and still remain fresh. Even the best coffee will taste bad if it's not fresh. In a glass carafe on the burner, the coffee is at its best for only 15 to 30 minutes. To maintain maximum taste and freshness for a longer period of time, we recommend transferring your brewed coffee immediately into an insulated airpot, where it will remain very fresh for 60 to 90 minutes. The brewer's carafe and filter basket can quickly become coated with coffee sediment and oils that can impart rancid flavors to your brew. Make sure to rinse the basket and carafe between each brewing to get rid of any leftover oils and grinds. Wash regularly with soap and hot water. If possible, purchase a spare basket for your brewer so you never use the same basket for regular and flavored coffees. © 2006-13 BAB, Inc. All rights reserved. Legal and Privacy Notice.